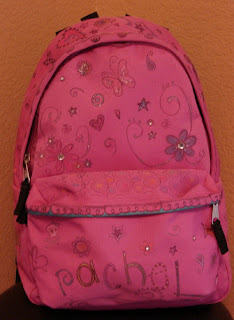 We are having a back to school sale August 27th thru September 1st. Everything in the store will be 25% off, so come stock up on adhesives, paper embellishments or that tool you have been wanting. We will not be giving punches during the sale or accepting other coupons. We did not want to leave out our ONLINE SHOPPERS, so to receive your 25% off use this code BTSS when you are at the check out page. We do want to warn our online shoppers that due to having such a big sale at our physical store too, we may run out of some items. We will refund those items or ship a week later when items are back in stock, you will be notified by email. To get you in the BACK TO SCHOOL MOOD.......check out this awesome back pack our newest member of the design team did, Aimee AKA Crazy Aimee! 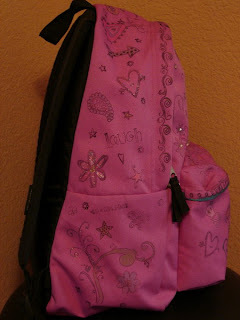 This inspired me to do my sons back pack and lunch box for his first day of school, bye bye sharpies! Anna Wight demonstrated her awesome stamping abilities. Thanks, Anna! You rock! The Dove's Nest catered our delicious dinner...YUMMY! Betty, Joanna, and Sherri dig in. 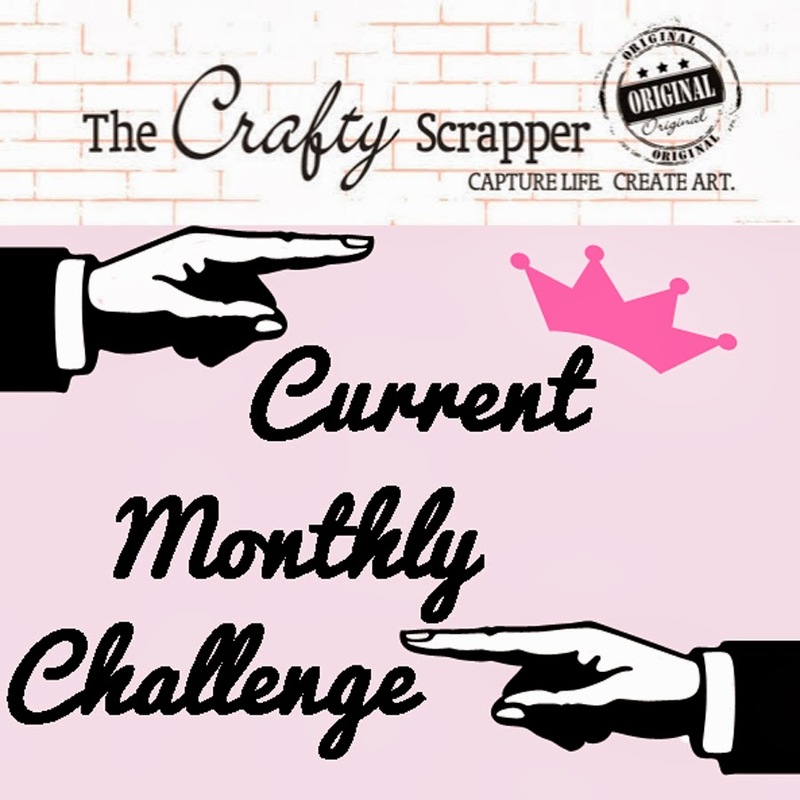 Wednesday evening was our official Crafty Scrapper Design Team kick-off! Our purpose is to showcase the Crafty Scrapper products and make scrappin' fun and easy for everyone! After dinner and a short discussion of upcoming events, Anna wowed us with her stamping technique demo. Then we all played around with her ideas and picked her brain for all her tricks of the trade. Afterall, the more we know, the better we scrap! The better we scrap, the more we can inspire! Thanks to all who came! My grandad's dream...my inspiration. My grandad invented and patented this Artist's Dream Kit back in the 70's. I am blessed to own his personal kit...complete with his used paints and paintbrushes. I treasure this b/c he died when I was just ten, yet his influence on my life was immense. I now proudly display (and use) this Dream Kit in my own studio. It reminds me daily of the power of Grandad's dreams and his resourceful nature. He didn't make much, if any, money on his invention. But I wonder how many artistic souls he inspired. I know he deeply influenced mine. Enjoy the photos of my studio and have an inspired day! This is my desk...a bit messy, I know! This is my armoire. I love that I can open it and have another work area and then close it to cover up the mess! I call this my "thinkin' chair". I usually have a cup of hot tea on the dream kit table. My messy, but organized closet. There are shelves up the sides you cannot see. I love artbins to hold my many projects in progress. What a fun day we had, 14 creative young lady scrapbookers showed up for a 5 hour crop and class. Annette and I designed this adorable notebook purse for them to make. The girls laughed, told stories, ate pizza, and learned several new techniques. It was fun to watch the girls walking around the shop with their new notebook purses! And of course they loved posing for a group pictures. We also helped Katie celebrate her 10th birthday today. She was surprised by a cake, girls singing HAPPY BIRTHDAY and me setting the Tiara on the cake on fire! Sorry Katie, a little stickles should fix that. Give me an ordinary product and I just can't help making something fun out of it. 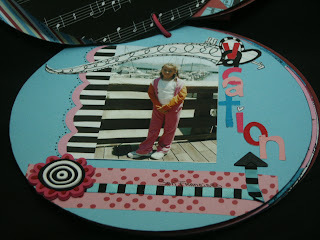 Let me use Mod Podge and sand the edges - woo hoo - I am in scrapbooking Heaven! Hot glue something on the project? ...wow just too much. I have to rest after that one. So check out these 2 fun projects I got to work on. Carolyn has what you need in the store to duplicate them both. But of course, YOU would make them even more special with your great ideas and imagination. If you want to see these two spooky items first hand, come by the store. They are waiting for you. 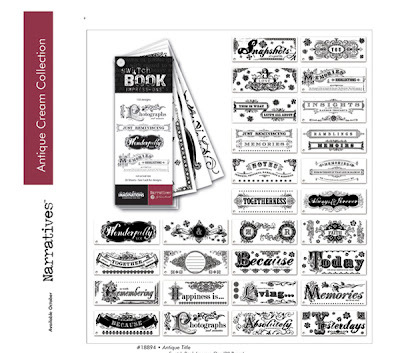 I was fortunate enough last week to get my hands on these great new papers from Luxe Designs. And the jotters are just so cute for an ounce or a pound of journaling. So this is what I did with them. This is a layout of my favorite daddy-daughter team. They were on a special date when I was able to snap this photo. My friend Rebecca's husband is such an adoring father and Mikayla is one lucky girl. And then there is my granddaughter Izzy. Well, she is truly a daddy's girl (and a granddaddy's girl). So I had to celebrate that. Love, Love, LOVE the colors and patterns of these papers. And I can barely do a layout without the Prima flowers anymore. I had one more full sheet of this great Luxe Designs paper and some scraps from the above layouts, so I was quickly able to put together this little mini book of our Izzy. Stamps, Primas, Jotters, fabric and brads.....the book came together in a snap. Mini books are a passion of mine. So this one was a joy to make. These are all on display in the store and I would love to get your feedback. Also be sure to let Carolyn know that you LOVE her paper and product choices. We've got a good thing going in Waxahachie for sure. I love all of the inspiration and hope you do too. Every Friday night of the month except for one the store has late night crops until Midnight. On that one weekend of the month, we do a Saturday crop which is all day until Midnight. Today is the Saturday crop. 28 women came and cropped together, enjoying pizza, chocolate eclair dessert and each other. It was so much fun that several people forgot to take pictures, even though they had their cameras....so you'll just have to take our word for it, unless someone decides to send in a couple pics. Come join us in October for this crop. Date has not been determined yet, but more information will come here on the blog. 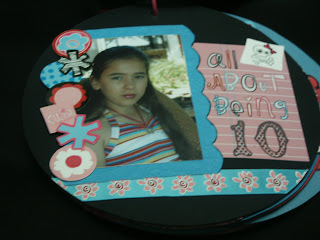 I have been an avid scrapbooker for over 10 years. I loved it so much that when given an opportunity to start a retail business in something I enjoyed, I chose Scrapbooking. I ran a very successful scrapbook business for over three years. 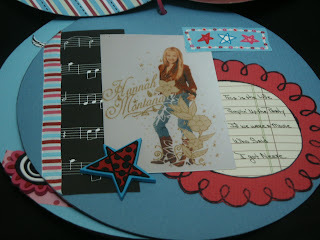 I decided to take a break from retail and have enjoyed scrapbooking my own things for a while. My style of scrapbooking is one of clean lines. My favorite scrapbooking subject is my granddaughter Natalie. Natalie is pretty well known in this area since my layouts of her have been on display at either my store or this store since Natalie was very young. One of my other passions is the breast cancer cause. My daughter walks in this each year. Last year we coordinated the crop for the cure, which raised nearly $1500.00. This year we hope to beat that amount. It has turned out to be a very popular event at the store. On display at the store right now is a book I did a couple of years ago about my daughter's walk along with prizes for raffle drawings. It should be a fun day at the store. My husband and I also belong to a group that enjoys old cars and we like to travel. Needless to say, we stay busy and have many friends in the area that we enjoy spending time with. This book is one I did recently of Natalie's favorite things at age 10. 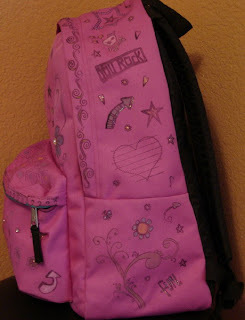 I used the Love Elsie Roxie line of papers and embellishments. Her last collection was such a big hit at the store and GASC, we had to keep ordering more. You will love these new collections, they will be shipping in September.......ENJOY! 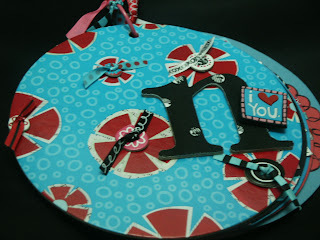 Scrapbooking was Love At First Sight! My first Daughter-In-Love was showing me her albums on our visit to Albuquerque, New Mexico. I sat up ALL night long, doing what Scrappers do with glazed eyes frantically trying to absorb it all. For years it was the only location of a Scrap booking store, it was small, but it was always the first and last place on our trips out to see them. My mission since then, trying all the new stuff and loving it all. The toys invented for us really keeps my creative juices flowing even after 12 years. I love the crops as I always learn something new from others. Being a Mother of Five, Grandmother of 14 and now a new Great Grandmother, I never run out of pictures. My previous history is teaching Oil Painting and Crafting. I inherited my crafty side from my Mother and Grand Mother, now to pass it on to others is a delight for me. My love of pictures was instilled early in my life by my dear Mother. She told us to take pictures of everyday stuff not just special occasions. You think you will remember things, or looks, but time and age will dim those precious memories. Sometimes tragedies will happen and you may lose the chance to get that cherished picture. They had 2 house fires when she was growing up and lost most pictures that they had. Our children and grandchildren are living in a special time when they can actually see earlier descendants that have passed on. My husband and I have discussed how exciting it would be to see yourself as a small child or to be able to see your great grand parents on a video or CD. You could get more of a vision of their personality by actually seeing them. Kudos to modern technology. 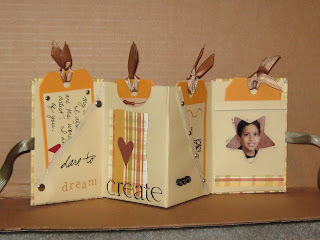 The wide scope of Scrap booking is truly fantastic……have a blast! The Canvas Album was just a real treat to make. This is my youngest Grandchild…not hard at all to decide what I wanted to do. The tag on the front holds one of the smallest pictures you wonder how to use them. The Stretched Canvas is the front and back for your Album with card stock folded for you inner pages. Embellish with “out of the box” imagination. As you see I love sewing, metal, ribbons, brads, stamping and chalking. 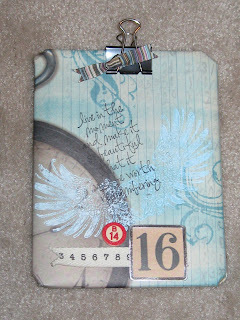 The Sticker Borders are really great on this type of Scrap booking. The Cousins is on an 8 X 10 Canvas Panel, use any size to fit your need of space or pictures. I mounted magnets on the back to make it an Ice Box note holder. When I printed the pictures of the girls, I just had to make this. 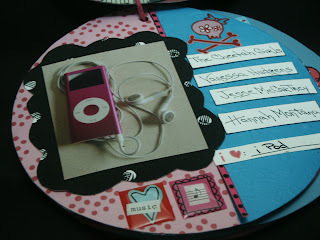 How cute would it be to make one for each child as their own personal message center? Possibilities would be chores to do, items they need to get, just an I Love You note, more pictures or game schedule for the pocket across the bottom. Another idea would be to purchase a metal pan, tray etc and hang it in their room. So easy and quick to make. Good Birthday and Christmas gifts for their friends too. It's me again, here to finish my post from earlier today. By the way, I had my boss take this picture of me and I decided to post it here. Since I don't have anything that's new in my studio I'm going to post some of my favorite projects from the past. All my stuff has been packed away and still is...I haven't created anything in a really long time. I'm having terrible withdrawls...my fingers are itching to do something.Until then enjoy some things from the past . 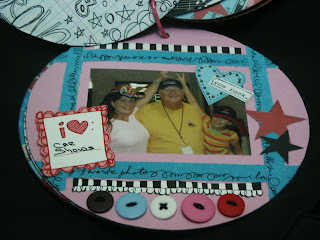 This little project was one of my favorites when I worked at the Scrappity Do Dah store in Grand Prairie. I was in charge of the make n takes there, and I have to admit it was the best part of my job. I really enjoyed coming up with something new and fun to make once a month. My youngest son is a great artist and this little book was my way of telling him how proud I was of him. I honestly do not know what my kids are going to do with all the things that I have made them. Hopefully, show their kids some day. This was the inside. I love to go to trunk shows, especially at a rubber stamp store. Me and my best friend Lisa went to a Tim Holtz trunk show at a local rubber stamp store and got to play with his new stamps. This is what we made...needless to say I bought all the stamps that were in this great make n take. I'm a sucker for stamps. And the pair of wings in this project were to die for. Rubber Stamping was my first passion and will probably remain the thing that I am most creative with. I love it! Can you believe it's August, and i'm already thinking about Christmas. In the process of moving I found this and it just made me want to start making Christmas things. This is a little tree that I made for Christmas last year to add to my tree collection. I love to make Christmas things!!! 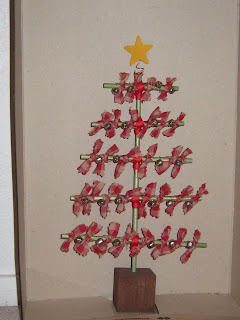 This year I want to get together with friends (like I did last year) and make handmade Christmas ornaments for my tree. We had a blast. Well, that's all I have for right now. This weekend I went to a Donna Downey class and made an incredible 12 x 12 album out of two pieces of 12 x 12 chipboard and 12 pieces of 81/2 x 11 paper. I hope to show you in my next post. We had to reschedule this class due to so many conflicting schedules. It has been moved to August 30th 6:30pm and September 1st 10:30am. Good thing about postponing it, was Annette decided to add two chipboard cards and show how to make a fast and funky card in minute when you are in a bind......call the store to reserve your spot! Well, ladies, allow me to introduce myself...I am Joanna AKA scrapperangel. I am so excited about this blog that I just had to post something right away. I didn't want to be the last one to do this. Everyone is so on the ball, and I am way behind on everything. I recently moved from Duncanville to Coppell (just last Thursday to be exact) and I am still unpacking the mess. ( My house is too small!!! ) Well, in the process of the move both my film camera and my digital camera were stolen. Right out from under my nose. I'm telling you that I thought I had it all under control but I obviously didn't. They were good...I'm not so upset about the camera as I am about the pictures that were in it. Let this be a lesson in taking care of your photos, especially those in your digital camera. If I had just loaded them on my computer in some sort of program on say a monthly basis I wouldn't be missing some of them. Well, lessoned learned for us all...I hope. I have been a paper crafter for as long as I can remember. This passion really took off about 10 years ago with my very first rubber stamp. It was a Hero Arts teddy bear and I was asked to make some baby shower invitations. That's where it all began...I've been making things (all kinds of things) out of paper. I enjoy this hobby so much. There is not a day that goes by that I'm not dreaming of something that I can create. It brings a smile to my face and a song to my heart. Here is the challenge for the newest card swap. Make 7 cards using the template posted here. It is up to you what papers or stamps or other things you use on the card. It is up to you what size you make the cards. Please include envelopes. Just have them to the store by September 28, 2007 and we'll get them swapped out and ready for you to take back by the first of October. Join in the fun. ........some even know me as A-I-M-E-E, dashes included. I am a newer member to the design team. I have always been a crafty person but only made my first layout, about two years ago. I don't think I have a certain "style" of scrapping, BUT I do love my stamps. John and I have been together about 4 years. We moved here from California in November 2005. We finally bought our first house the end of February, and after a short 3 month remodel we moved in the first week in June. I only have one baby Dalton and he will be sixteen this Sunday. (time has flown by) Dalton always seems to inspire me to scrapbook, he is always keeping things that I could use on a layout, receipts, ticket stubs, oh and the screw the removed from his broken leg. After moving to Texas I got a job doing billing and collections for a small company, but decided a few months ago that was not for me, Now I have a in home day care, so far i am really enjoying it, but i am going to have to get a part time job to support my stamp addiction. 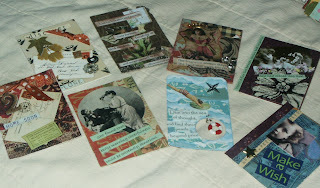 Here are some cards I made with the new Crafty Secret Tea & Coffee stamps. I used colored pencils and with a blending tool and mineral spirits I blended the colors. On the coffee cup ones I used Diamond glaze to give it that epoxy look. Also used was a gelly roll star dust pen and We R Memory Keepers paper. Oh and we cannot forget the Heidi Swapp bling bling crown! I have only been involved in this kind of artform for about a year and a half. I have always loved crafts and artistic endeavors and have done many things that used color, balance, shape and similar skills. Like several others I looked forward to doing art kits, making Barbie furniture, and sitting and coloring with my crayons endlessly as a kid. Unlike many of the others on the team, I don't design or do art work for anyone else, and have never been on a team like this elsewhere. I am very excited about the team becoming more formalized and can't wait to see what is in the future for us. 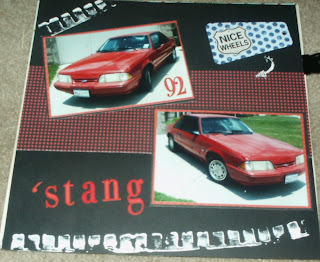 When I first starting doing projects with scrapbook supplies I tended toward altered art sort of items. Doing layouts is the newest thing I have done. 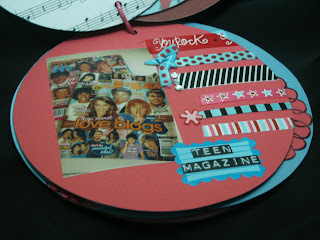 I like many styles of art, decor and of course scrapbook work. Carolyn tells people I am the "out of the box" girl. 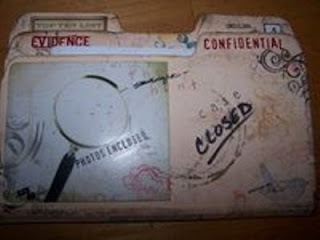 I enjoy using unusual items on my pieces and have quite a bit of vintage papers and pictures that I like to use as well. I don't think I have a particular style, each piece is driven by a photo or other thought in my head. I do enjoy mixing patterns and sometimes use unusual color combinations. I will often try ideas that come into my head --usually very impulsively on a page. I also make happy accidents from time to time. After I had completed this very simple layout page of my son's car I decided to drive a toy truck through white paint and then drive it on the paper. I enjoy doing all sizes of art/scrap work including 1 x 1 inch pieces(inchies), 2 1/2 x 3 1/2 inch ATCs, 4 x 4 inch pieces all the way up to 12 x 12 layouts. Each size has it's own challenges. I participate in several swaps with art groups and frequently do challenges from magazines and these groups. I also still alter boxes, tins, frames and about anything else I can figure out that glue, paper, paint or treatments will stick to. These are some of the ATCs I have made. 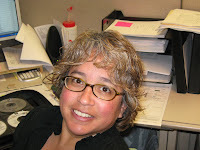 In my non-scrap life, I am a Registered Nurse and work full time for a managed care company. I have just started telecommuting for this job, which is wonderful so far. I have a daughter, a son, a daughter-in-law and a granddaughter. All the main focus of my life. They are the best. They are also great subjects for layouts. I have lived in Texas since 1976, most of the time in Arlington, moving to this area in 2002. I try to keep a blog going here. Since moving out here, I have done quite a few things related to downtown Waxahachie, including window displays for a couple of stores. I work with Carolyn doing the windows for this store too. I look forward to working on things for the team and working with you. Hello, hello! I'm Anna Wight! Hi. My Name Is Carolyn.